So, Steve Jackson Games made this announcement yesterday in regards to Car Wars. As one of their stretch goal on the Ogre Designer’s Edition Kickstarter, they were going to go into playtest and start on another version of Car Wars. Does the hint of “…while we work on the big stuff!” mean that it’s really going to happen? $700,000 – GOAL ACHIEVED! – Drive Offensively! We will launch a Kickstarter project for Car Wars! We *think* this will turn out to be a refinement of Car Wars Compendium 2.5, but you’ll tell us. Our supporters at the [new] $23 level and higher will be invited to join an exclusive Car Wars forum, where we’ll build the new edition from the ground up – issues like “which classic cover do we use?,” “10 phase, 5 phase, or 3 phase movement?,” and “do we include boats?” Once the project launches, surveys will be open to the public, but only supporters of the current project will get in on the preliminary planning. And we’ll take everything we have learned from our Ogre Kickstarter project to make the Car Wars project even better. If we make this goal, the private Car Warsforum and surveys will launch before the end of 2012. The game will be published in late 2013. I for one was a fan of Car Wars, and I’d love to see what the next incarnation is! How about you? What do you think about the up-coming Car Wars? What did you think about the original? Secret Weapon Miniatures sent out this email, and I’m sure most of you are aware of it, but thought I’d spread the word some more. Besides this sale, what other sales are going on? Leave a comment and lets see if we can get them all! It’s time for the annual Black Friday madness here in America, and this year we’re jumping in with one heck of a sale… for FIVE WEEKS! This offer extends to everything in the Secret Weapon catalog, except for gift vouchers, and those items we stock from Raphael and Juweela. Resin bases? YES! Weathering products? YES! The Secret Weapon Washes? OH YES! Everything in our catalog is included… and the sale starts tomorrow! The martial skills of the Tengu are legendary across the Golden Empire. Although few in number the avian Yokais long lives give them ample time to gain mastery of not only the martial but also learn the secrets of the kami who call the mountains their home. Hidden away in their mountain top cities and guarded by the devoted hill tribes few have ever seen these mysterious warriors. What has brought Sojobo down from the mountains and to the aid of the Tengu’s old allies the Temple is not known. Sojobo’s skills in combat are equalled by very few. Now he has spread his great wings and left his mountain home the spirits and prospects of the people of the Ro-Kan can only be lifted as a result. via Tengu! | GCT Studios. Galeforce 9, producers of board games, terrain, and miniature gaming accessories is running a promotion to earn a new card for their game Firefly. One of the characters, Wash, in the series / movie plays with some toy dinosaurs to help pass the time. So, GF9 included a paper 2-d version of one of the dinosaurs as the first player token. Part of their promo is to have players show what they use instead of the 2-d player token. My group, below, uses a stuffed dinosaur. We pretend he eases the pain of not finishing a job or being unlucky enough to fail some skill rolls. 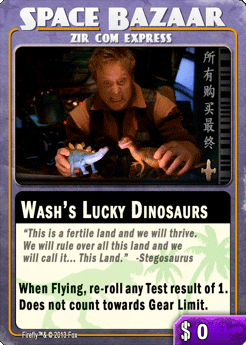 The new card is called Wash’s Lucky Dinosaurs. 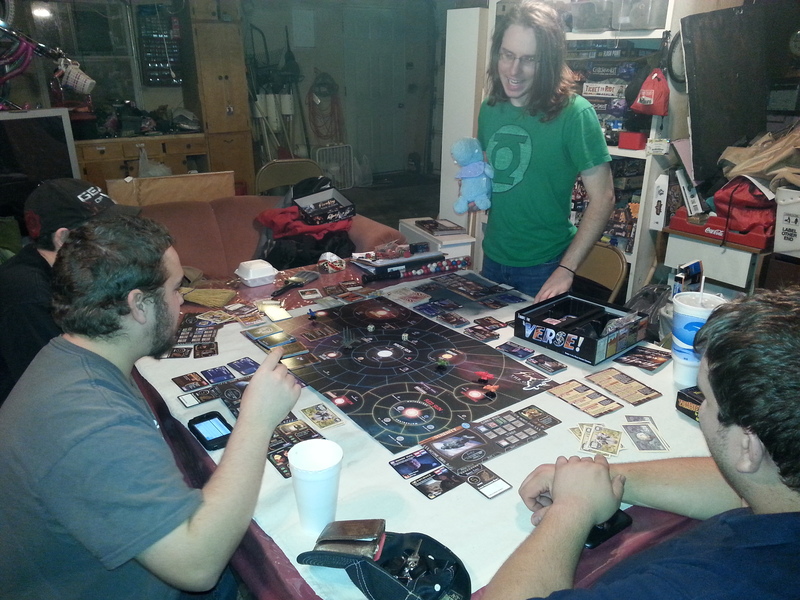 So, here is my group of players playing Firefly the game in hopes of getting that promo card. Above, Phil, is holding a stuffed dinosaur to help ease the pain of failing a job from Niska. He now has to decide which of his crew isn’t pulling their own weight and get rid of them. If you play Firefly, what do you use as a first player token? Images obtained from the Dawn: Rise of the Occulites Kickstarter Page, by Eagle games and Darwin Games. Since Dawn: Rise of the Occulites is steaming away on Kickstarter, and the game’s creater, Ben Boersma agreed to an interview, I thought I’d send him along some questions and see how things are going. Hi Ben! Glad you could take the time out of the busy Kickstarter to answer a few questions for the readers of Pen and Lead. Dawn: Rise of the Occulites is currently on Kickstarter and has met its funding goal. There are still over 20 days left to contribute- so it’s stretch goals here on out. First, to help out the readers of the blog, can you give us a brief run down or overview of the game? Maybe something people can’t get from a quick Google search or read through the Kickstarter? Dawn is a miniatures boardgame that sees you control a Tribe of Occulites through a variety of different scenarios. At the heart of the game is the Natural Selection Deck which you draw from to create a hand of 7 cards. The management of these cards is vital in making strong tactical decisions to achieve the scenario’s goals. Each Tribe contains five Occulites, one of which is your Chief. While your Chief is alive, he bestows certain actions that can be taken by spending your limited Tribal Token resources. Dawn has a Core set of rules that can be played by just about anyone, but also contains advanced rules that can be layered in to add depth and additional decisions to make during the game. Layering these in provides a gentle learning curve up to the full game, but Dawn can be played at any of these levels whilst still providing a deep, thematic and enjoyable game. It can be played as stand alone scenarios or there are rules to link these together into a full Sungem Season and develop your Tribe by learning abilities and picking up skills through your actions on the table. Doing a quick memory jog, I can remember seeing information about your unique miniature game, Dawn: Rise of the Occulites, a couple of years ago. Tabletop Gaming News posted your Developer Diaries # 1 and introduced people to your game and setting back in January of 2011. Obviously you have been working on the game for a long time. How long have you been working on Dawn: Rise of the Occulites before the news hit the internet and gaming news sites? At the moment, I’ve been working on the Rise of the Occulites Saga games for over seven years now, but the concept of the Occulites and their world goes back further. Dawn is the first one that I started working on and the future development of the game continues even today as I continue to expand the world. I am really passionate about the Rise of the Occulites setting and proud of what I’ve been able to do with Dawn. Obviously, development of a game can take a few years. During that time, what has been the biggest challenge to you, as designer of the game? There are many big challenges with a game like this. One of these is coming up with a system that allows many varied scenarios so that combat isn’t always the focus and the play style of each scenario changes. I think this adds enormous depth and replayability to a game. Making each Tribe play differently and to their thematic strengths, whilst not making any of them too weak or overpowered. Writing the rules clearly so that your intention comes across succinctly in the rulebook. This is so much harder than you would first think and I have a lot of respect for those that have that skill. Being able to seek feedback from friends around the world on how the rules for Dawn read and were laid out was vital and I am extremely grateful to them for their help. One huge challenge that I had was whether to develop it as a full blown miniatures game, or as a boardgame like I ended up doing. Whilst seeming similar in scope, the reality is very different and deciding on where to take the game would shape how it was produced. Without Eagle Games’ help, I would not have been able to make it a boardgame and it would have been a miniatures game instead. I am thrilled with the decision to go down the boardgame path and in a perfect world, that is what I wanted to do. I have learned a lot of new skills as well, I’ve taught myself to illustrate and have improved much over the years (to the point where I’m redoing most of the card art for the game due to a change in my art style). Besides the challenges, the development must include some great moments as well as some frustrating ones. What has been the greatest source of enjoyment for you as well as the greatest source of discouragement? The greatest source of enjoyment has come from two sources. One, developing the world and then engineering thematic rules for the world and its inhabitants and after hard work modifying them, seeing them just click into place. But the second one would have to be seeing the reaction people have the unique setting. Hearing things like “my boy has not stopped drawing Occulites since he saw them” or “my daughter and I are really excited to play” is incredibly satisfying and rewarding. The greatest source of discouragement was after all the hard work I put in, seeing the last campaign fall apart. That was absolutely soul crushingly heartbreaking. However from that, I’ve put in a lot of work listening to feedback and making adjustments to improve the overall package. So through that discouragement, I’ve drawn a lot of strength and in the end I think the first campaign failing has helped Dawn become a better game and ensured the success of this second one. Dawn: Rise of the Occulites has some unique imagery, both in the model design and in the world of Crepusculum. The Occulites are beings with a single eyestalk rising above their bodies. What inspired you to create such wonderful designs that definitely stand out from the traditional humanoid sculpts and ideas that others have? Essentially, what inspiration did you have to create the Occulites and the world they live in? You know, I get asked this a lot and I’ve never really been able to nail it down. I believe that they are the culmination of my childhood experiences. I used to explore the wetlands and bush when I was little (and still do now). I was obsessed with frogs and loved looking for them and other creatures. I used to collect snails and trade them with my next door neighbour. I used to watch shows like Trapdoor and The Muppets and my brothers and I would create our own monsters that we would draw when we were kids. I honestly think that the Occulites and every other creature in the Rise of the Occulites setting is a reflection of the things I enjoyed when I was a child. Parts of all the creatures in Dawn come from different experiences I’ve had. From the frog-like feet of the Palaudis, to the snail-like eyestalks of all the Occulites, the frill of the Luftles and many other things, they are all shaped by things in my life. I don’t want to get too deep or anything, but Dawn is a really personal game for me. Something unique to share with friends and family. So the game was relaunched on Kickstarter. The first attempt didn’t end up the way you wanted, but I’m sure the campaign taught you a lot about the funding model. Obviously, this time around, Dawn: Rise of the Occulites was a quick success. What do you attribute to the success of this second campaign as compared to the first one? It has come down to a couple of things. Having all aspects of shipping to around the world fully investigated, researched and covered in advance of the campaign (we had a few hiccups come up last time), having prepaint images ready before the campaign started (last time these came through too late and we weren’t happy with them and have ended up paying more to ensure a MUCH higher standard of paint job), better communication, more relevant stretch goals and perhaps an improvement in the cards may have played some part? I also think that Dawn has had more exposure as well which has helped. It is a uniquely themed niche game from an Australian designer that most people wouldn’t have heard of before (unless you are in the indie miniatures game community), so exposure has been important. What advice or help can you give others who may be interested in pursuing Kickstarter as a funding platform? Very simply, plan for every outcome in advance and don’t be surprised or upset when something you weren’t expecting happens. Just adapt and roll with it. Kickstarter is making Dawn: Rise of the Occulites a reality. If you were to find a traditional approach to publishing and releasing the game, how do you think it might be different? Essentially, using Kickstarter has allowed the game to grow. What do the backers have to look forward to that a traditional approach wouldn’t have allowed? Well, with a traditional approach, I’m not sure that Dawn – Rise of the Occulites would even be published. It is a huge game with really different and unique theme. These are not characters that are your regular fantasy archetypes. There are no dwarfs or elves, no zombies and no Cthulu, so for many publishers that would be a risk they may not be willing to take no matter how good the game is. Luckily for me Eagle was open to the idea and Kickstarter has now allowed us to release much more than we would have been able to if we had taken a traditional approach. With a traditional approach, the base game would have been smaller. The Tribes would likely only have two unique figures (Chief and Tribe member) and would have not been able to be prepainted. There would have been less scenarios as the components required for those scenarios would have added to much to the content. The individual player boards with pegs would probably have been altered for cost savings and been much less useful than they are now. There is also no way that any of the Expansion Tribes would be have been made until the base game had proven that it was popular. So going through KS has so far allowed us to increase the size and quality of the base game, produce the Expansion Tribes and the optional card expansions and we wouldn’t be on our way to getting Puscuals and Nymphlets sculpted up and moulded if we hit our higher stretch goals. So in a nutshell, KS has allowed us to release lots more Dawn and give backers much more content and a better deal than we would have been able to otherwise. Speaking of the Kickstarter, which pledge would you suggest to a potential backer and why? What can they expect from their pledge? Ok, so it depends what you are after from the game. If you want access to all the Tribes, there are two pledge levels that we would recommend as being the best value for money. If you want to paint the figures yourself, or are happy with non-painted figures, then Puscual Hunter is your best bet. That will get you the Core game and all three Tribe Expansions, as well as all the listed Stretch Goals. There are some early birds left of these and they clock in at $135. If you are after all the Tribes and to have all the figures really nicely painted, then Sunmaster is the pledge level you want. That gets you the base game, the three Tribe expansions and all the Stretch goals listed. There are some early birds left at $245 and $246. At Puscual Hunter and Sunmaster you also receive a bonus 9 Luftles to match the rest of your figures (so unpainted at Puscual Hunter and painted at Sunmaster). What can they expect from their pledge? My absolute gratitude and thanks as well as an awesome game that they can play with their friends and families for years to come. The stretch goals add expansions to the game and include the additional Occulite tribes. According to Board Game Geek, the game is for 2-4 players. Do the expansions add more players to the game, or simply more options for the 2-4 players? What do the expansions offer that the base game doesn’t? The expansion Tribes allow for more players (2-4 plays well, 5 needs some alterations otherwise it can be too slow between turns), but they also add more options to the game. Each Tribe brings a unique play style as well as their set of innate and learned abilities. They also bring two more scenarios each to the game which can be slotted seemlessly into a campaign or can be played as stand alone. They also bring the terrain that their Tribe is associated with and in some cases (Floris) a new predator, the Drunmoth. The game itself isn’t quite a miniature game, nor is it quite a board game. How do you successfully merge the two distinct types of games into a successful single component like you did with Dawn? I think that it was important to think about what the drawbacks for both of those types of games are as well as the positives and then try and merge the positives and take away the drawbacks. You obviously can’t do that with everything, but I think we’ve created a nice balance between the two with Dawn. For example, one of the biggest drawbacks for the general populace with miniature games is the measurement, so that had to go and we replaced it with hexes. Another example is the peg boards used as the individual player boards helping to keep track of your Tribe’s development in a much more user friendly format. The Natural Selection Deck itself helps to merge the miniature and board game aspects as well and I think really ties the game together nicely. Obviously, the core game pits two distinct tribes of Occulites against each other. Can you tell us about the different tribes in the base game as well as the additional tribes in the world of Crepusculum? How are the different and similar to the others? Each Tribe has evolved from a more primitive and basic form of Occulite, to adapt to their natural surroundings. So the Palaudis, who live in the swamp, have developed frog like feet, hydrophobic hair that keeps them from staying cold and wet after moving through the swamps. They have developed a natural alliance with the Luftles and treat them as true members of the Tribe. The Hydris live around waterways and so have a more streamlined body, they have gills to allow them to breathe underwater as well as fins and flippered feet. They are very adaptable. The Floris are masters of camouflage and can change their leafy coverings to blend in with their environment, often ambushing their oppponents with a savage aggression. They live in the bushlands and forests of Crepusculum. The Ignis are an honourable and noble Occulite species who dwell in the lava flats. They are skilled combatants and are able to use their skin to trap and release built up heat from the lava flats to their advantage. The Nimbus live high in the mountainous regions of the world and have evolved winged membranes that allow them to glide and fly short distances. Their hollow bones make them extremely maneuverable, but also susceptible to injury. Each Tribe plays different and for a more in depth look at each, you can check out the Tribe Spotlight updates on the Kickstarter. Besides the imagery in the models and world, what makes Dawn: Rise of the Occulites unique, mechanics wise? How are the conflicts within the game resolved? It has three separate functions. It can be used to activate figures (The greenish number set over the Occulite image) at the start of your turn. If you used this card for that purpose, you would be able to activate 3 Occulites on your turn. The third function is to use it for it’s card effect. This card’s effect is ‘Attack Opening’. If you discard this card when attacking, each 0 rolled counts as two successes. The management of these cards is absolutely vital for your Tribe’s success in the game. It creates simple problems that require difficult decisions to be made. Do you keep this card for its Activation number to get a lot done on a future turn? Or do you use it in an Attack to roll 10 dice? Or use it for its card effect? The Natural Selection Deck basically helps the game be easy to play, whilst still containing difficult decisions that actually matter. We are really proud of what the Natural Selection Deck brings to the game. With 16 different Card effects, as well as optional Advanced NSD cards bringing even more, the game is easy to play while being quite deep. Dawn: Rise of the Occulites is only the beginning of the Saga. What else (other projects, miniatures, games, etc) do you have in mind for the world of Crepusculum? It certainly is only the beginning of the Saga. There is LOTS more planned in the world of Crepusculum. First of all, there is much more planned for Dawn which we would love to release in the future, including regular support through downloadable scenarios, but also more Tribes, creatures, predators and terrain overlays, as long as the demand is there to support it. In terms of future games that follow this development, check out this link to see some of the things I’ve been working on for the Rise of the Occulites games. As you can see, there is much planned! I’m extremely passionate about the Rise of the Occulites setting and hope that others are too, allowing us to release more Occulite games in the future. Finally, for fun, if you could do the “Ultimate” game of Occulites, what would be? Disregard funding, publishing, retail, shipping. That is a difficult question as I love all the Occulite games that I’ve created. When I design a game like Dawn, I do go for the Ultimate straight away and then see if we can achieve it. Dawn is very close to being that ultimate game. Regardless of funding, shipping etc… I would love to have a fully 3D board with fully 3D terrain. One day, I’ll get around to making one of these for myself and hopefully someone else will be passionate enough to try it for themselves too and will share lots of photos of it! But all in all, I’m extremely proud of how we are offering up Dawn as is. For me it is an absolute dream come true that it is being produced and that families and friends all over the world will get to explore the world of the Occulites… and at the end of the day, that really is an ultimate achievement. Thanks again, Ben, for taking some time out to answer these questions. It is appreciated. Dawn: Rise of the Occulites is the first in the series of games centered around the Occulites. It is currently funding on Kickstarter and has met its funding goal with. The Kickstarter will end on Friday, Nov. 8th at 1am, EST time. Some new pledges have been added as part of a stretch goal, so if you missed out on an early bird, there are some “almost early bird” pledges now available. Give Rise: Dawn of the Occulites a look through and go pledge to make this game even bigger! The wait is over. The Orc “Schmeisser” Greatcoat Squad is finally here and I have to admit, we are pretty happy with how it has turned out. Inside, you will find 10 dudes packed with detail and flavor including a leader and an MG-42 gunner. If that’s not enough for you (and why it should be? ), we have prepared a company deal of three squads for a reduced price. This is our first full squad set, but we do promise – not the last! Hope you guys like them and consider the long wait worthwhile. I think they look pretty cool myself- If I was an Orc fanboy, I’d definitely pick these guys up on looks alone. 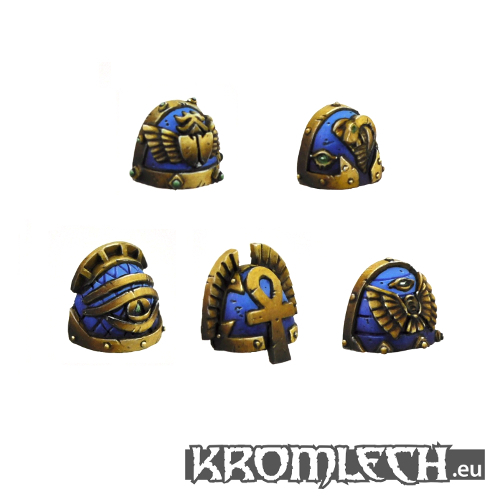 More from Kromlech- Stygian Shoulder Pads! 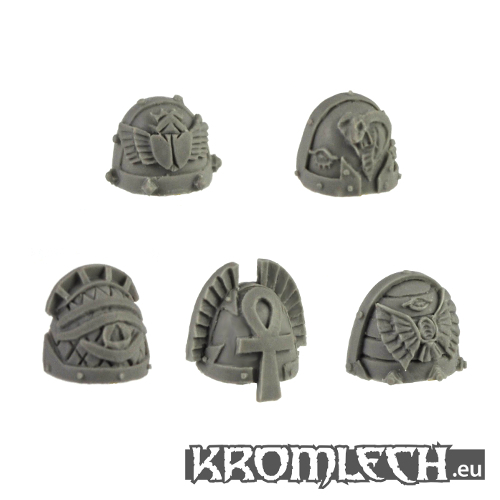 Kromlech again sent updates about their new products, and this time it comes from their Stygian line- Stygian Shoulder Pads. We _know_ that you like our Stygian range. Therefore we could not miss and opportunity to expand on it even more. Today, we proudly present a set of Stygian Praetorian Shoulder Pads. The set contains 10 shoulder pads, which should fit more bulky sf armoured soldiers. 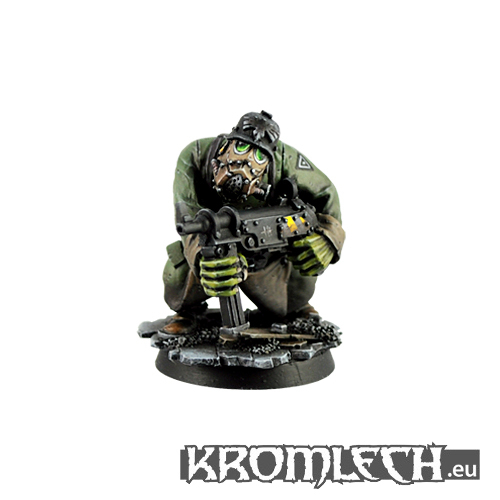 Kromlech, makers of resin bits, accessories, and models, has sent pictures of their new model, an Orc Pilot. I think he looks pretty good from the image. Been quite some time since we introduced you to a complete orc model, so I guess today is the day we fix this. 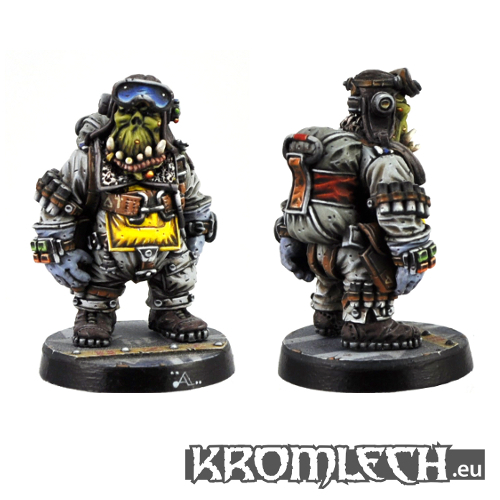 Behold, the one and only, brave, fat and not entirely competent – Orc Pilot! Give this guy a round of applause! He will need all the cheering, as he does not know it yet, but there is dirty underwear in his backpack, not a parachute. The model was designed by Igor Karpow and we owe the lovely paint job to no one else than Artur. …and, here is the image that was sent along. A great paint job. · We will be running the first of our annual Bushido Grand Master tournament. The Tournament will be a 50 rice event open to 24 players, lasting 4 rounds using the GCT Masters Tournament pack (Due for release soon). Players will all receive Silvermoon rewards for playing and we have some truly amazing prizes on offer including the opportunity for the Grand Master to work with the GCT team to concept a model of their choice.